How about just “Moronic”. We get it, your mummy-daddy or your elite JC or whatever made you study Western literature. This is assholic writing. The author goes on to talk about how Finland has done education its own way and been successful, completely failing to note that Finland’s egalitarian system is poles apart from Singapore’s cutthroat competition. 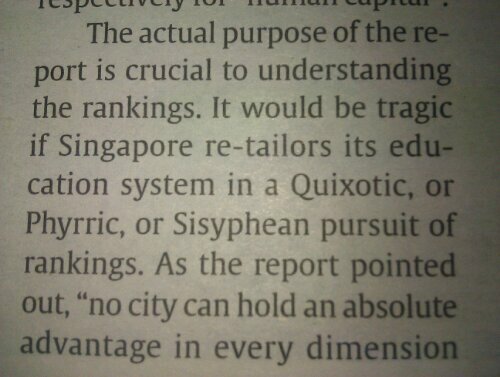 This entry was posted in Uncategorized and tagged education, language, soSingaporean. Bookmark the permalink.